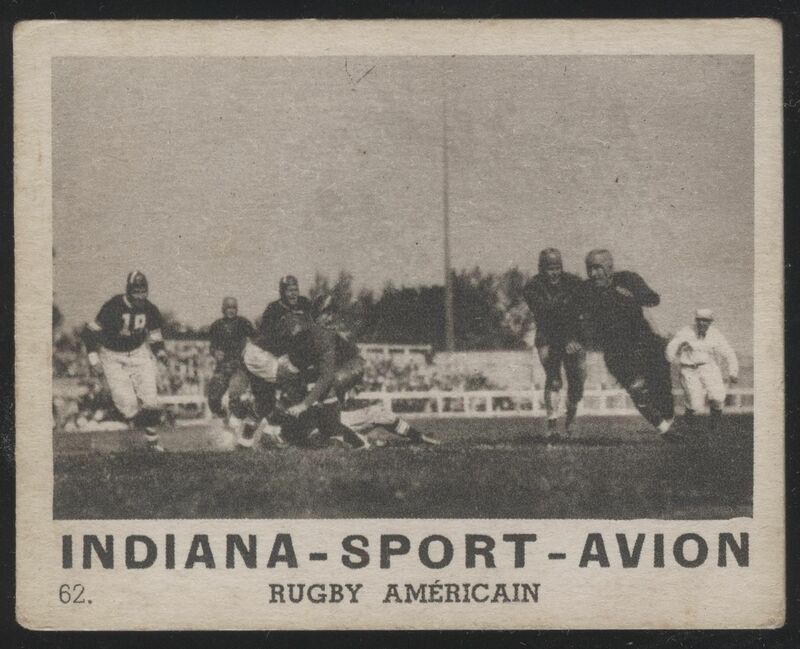 1936 Indiana Sport-Avion Packers vs. Cardinals -- Help IDing players? First, I have to thank Jeff Payne for turning me on to gridiron-uniforms.com. That was an enormous help. I've owned this card for probably close to a decade. I never seriously thought I would be able to identify anyone in it and, to be honest, it didn't look like anything that was worth identifying. This is a French multi-sport set from 1936, the Indiana is not in reference to the State of Indiana, just the name of the set. As best as I can tell, the set focuses exclusively on sporting events from 1935. It's boxing heavy, with many bouts depicted. Of course, being a French set, it also covers the '35 Tour de France quite generously, as well. There's even a Major League Baseball card for the transcendent Darrell "Cy" Blanton, who won the ERA title in '35. 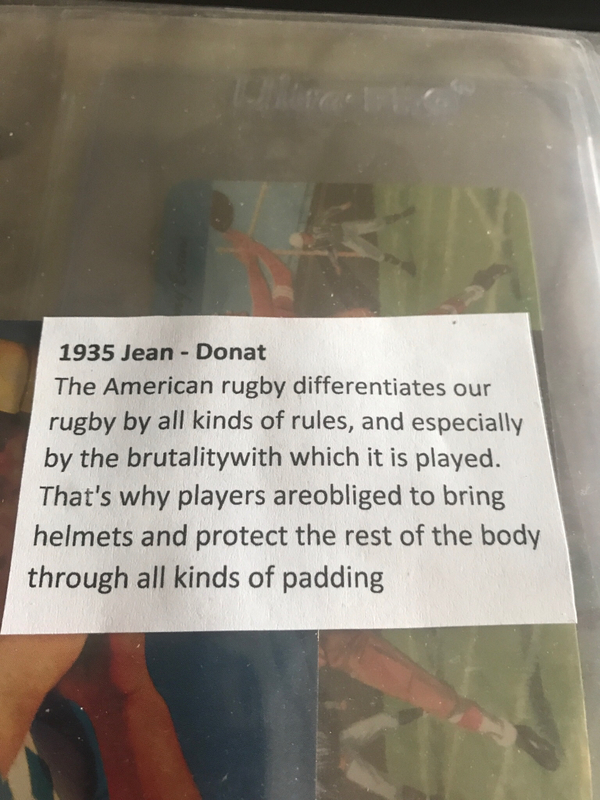 But this card just got lumped with the apathetic "American Rugby." For whatever reason, a fire got lit under me a few days ago and I thought I'd give it a run at trying to nail down the teams, thinking it might be a college game. Jeff was a hero and directed me toward the website and I looked at 1935, thinking this card, like all the others in the set, would be depicting a '35 event. Looking at the uniforms and especially the helmets, it became clear that the two possibilities were the Packers and the Cardinals. As it turns out they played each other three times that season. In week 1, the uniforms match up perfectly and it was the only game of the three that was played at City Stadium, which had the white one-beam fence all around the playing field like in the background of the card. Now the question was, would it be possible to identify any of the players? The easiest, of course, was #18 on the Cardinals. That's Bernie Hughes, who was an All-Pro corner the year before in his rookie campaign. But what about the Packers? 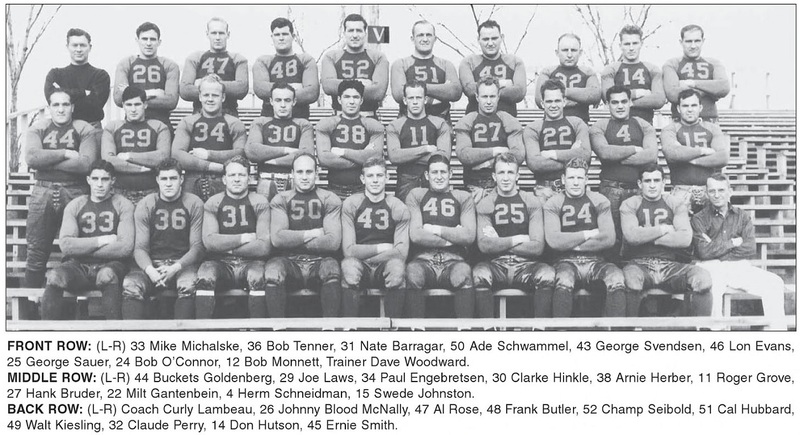 As best as I can tell, and I'm hoping that those of you that know more about this than me (which, if you're reading this, means you) can chime in, the lead blocker is Ernie Smith and the ball carrier is Johnny Blood. I don't care about being correct as much as I care about getting it right so if you've got a better idea please post below. Any and all help is greatly appreciated. Wow - a 1936 card featuring Johnny Blood would be an amazing find. I'd recommend trying my luck on the PFRA forum. Johnny Blood's biographer posts often. That is so cool. We need a general thread on this set. I'm struggling with whether that lead blocker could be Ernie Smith, Arthur. My challenge is just looking at the play as its developing, I would think a Tackle would have been engaged with a defender at the line of scrimmage. This to me looks more like a running back leaving the backfield on a sweep with either the fullback or right halfback with the ball. Thoughts? I know you thinking the lead blocker looked to big too be a back. Any idea how big all of the players you've identified were in size as compared to each other? Last edited by jefferyepayne; 08-17-2018 at 04:08 PM. Jeff, good observation about the likelihood of a back leading the play. I wonder if the lead blocker could be Clarke Hinkle? When I search for images of Hinkle, I see several with an "angry face" look that is somewhat visible in the image. Last edited by TanksAndSpartans; 08-17-2018 at 04:23 PM. I'm going off memory right now (which is, admittedly, rubbish) but I seem to remember there being not too many large (6' 1"+ 210+) players on the team when I looked at the roster. I'm nowhere near 100% on Ernie Smith, I just started eliminating others based on size and face. However, I never looked at the right side of the line. If it were a sweep, it would make sense that it could be a right lineman pulling. The blocker looks big. It's difficult to tell definitively with the trees in the background but he looks thick, like he's got some meat on his bones. After looking at this team photo I take back my Ernie Smith guess. I think it might be Buckets Goldenberg. I don't think the ball carrier is Clark Hinkle. He's got a pretty unique face and it doesn't seem to match. Going off ProFootballRef's stats for the '35 Packers we can at least narrow the pool down. These can't be the total stats for the season, so that's something to take into account. Obviously, I'm in no position to claim that the ball carrier is Johnny Blood. I feel pretty confident that it isn't Clark Hinkle. That's about as far as I think I can take it on my own. I signed up for the PFRA forum but I'm still waiting to be confirmed. I'm open to and appreciate any and all input here as you've all got much more knowledge and experience with this than I do. My next quest will be identifying the ice hockey card. Considered the right tackle too but his positioning for a pulling sweep doesn't like right to me either. I think you've nailed it with Goldberg, Arthur. Great call! The position (BB) stands for blocking back ... someone in the backfield who's primary position is blocking. Last edited by TanksAndSpartans; 08-17-2018 at 11:32 PM. 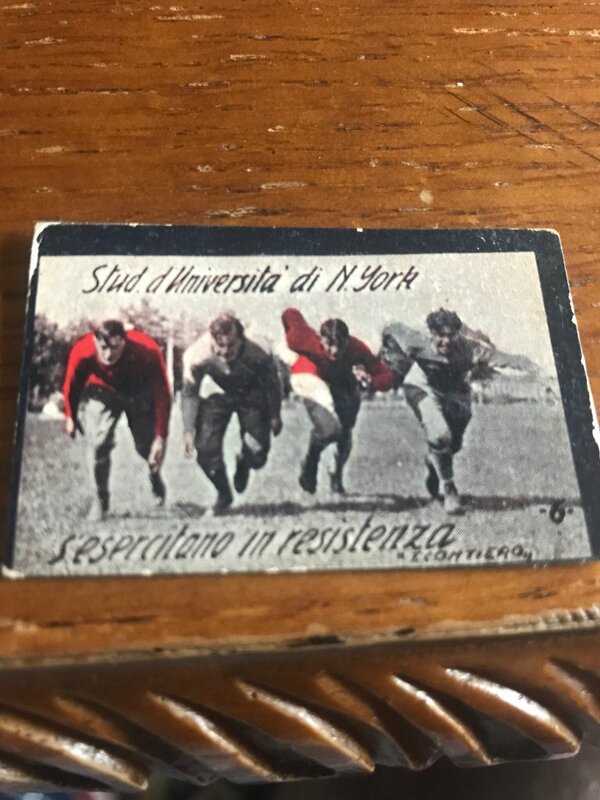 I think a general thread on foreign football cards would be neat. I’ve slowly been accumulating them and have some pretty cool ones. 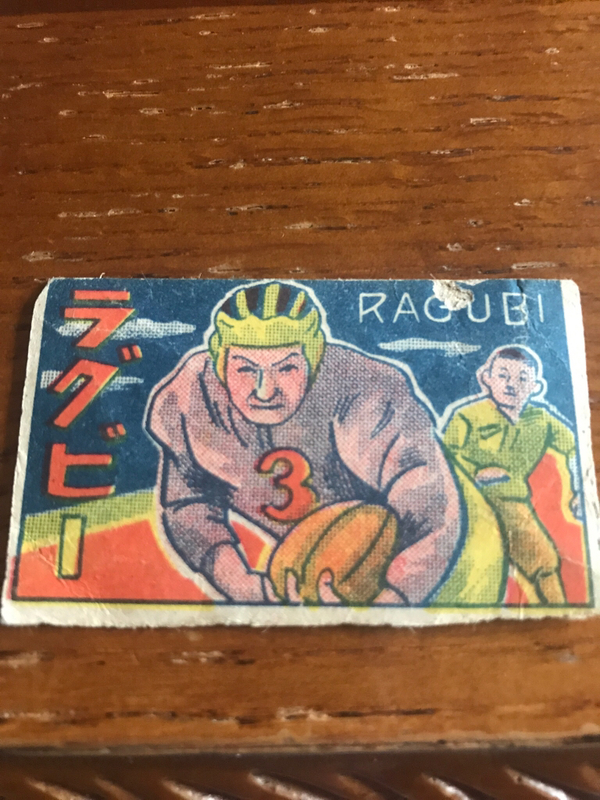 Who would you say this is on this 1930’s Japanese Card? Here’s what the back of the card says. I guess they were ahead of their time given all the controversy around Concussions. John, thank you. I had come across the box score at one point but like a fool I didn't copy and save it. Then on subsequent attempts I couldn't relocate it so I really appreciate you hunting it down. I wonder why they have two entries for Bruder? I think we can safely eliminate Hutson and Herber as I'm pretty sure this play is going to result in positive yardage. I also think I'm fairly comfortable with the blocker being Goldenberg, which eliminates him from contention. That leaves Johnston, Blood, Bruder, and Laws. A pretty difficult task and definitely beyond the scope of my abilities. Al, glad I could help. The 30s are one of my favorite decades, so this has been a lot of fun for me. I'm awful with faces. Jeff posted an image of some players in the Mayo set once and I think I got them all wrong. Last edited by TanksAndSpartans; 08-18-2018 at 10:07 AM. I talked to Ralph via pm on the other board and he said it didn't look like Blood to him. If you want me to just post the image over there I can - let me know. I think a general thread on foreign football cards would be neat. Sure, thanks. I still haven't had my registration approved and I've checked my spam folder and everything so my reputation has obviously preceded me.